Recently my oldest son turned 4! Honestly, I'm still in shock that I have a 4 year old, but we won't get into all that. Instead, I'm going to tell you all about his awesome Birthday Party. He asked me for a Train birthday and for a Pirate Birthday. You see, his longest lasting love is with Trains, but his latest favorite is pretending to be a pirate, thanks to Disney Junior's latest show Jake and the Never Land Pirates. So on his actual birthday we had train pancakes and he got a train. For his friends we had a Pirate Party! The party was exciting to prepare, and it was a whole lot of fun! Instead of one really long post I'm going to break up his birthday into a series of posts so that each part of the party get's a better description. You can also look forward to one or two tutorials. Today I'm going to share the invitation with you. I use Adobe Illustrator and Adobe InDesign for a lot of my designs like this. (Illustrator is best for drawing and converting images in, and InDesign is amazing for Print Products, combine the two and you have Endless Power! OK, I'm totally kidding about that, but some days, that is just how I feel.) This time I just used Illustrator because there were a lot of images to deal with and the text was really simple. It might sound like a ton of work to some, but it really didn't take me that long. I absolutely love how it turned out! 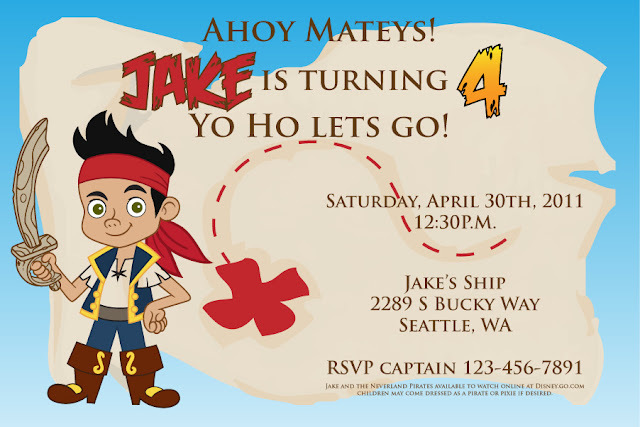 I can't wait to share more of the fun details of this Pirate Party with you! I've also got some more fun and exciting things to share too, but this week you'll just be overwhelmed with Pirate Party goodness! This is so fun! My boys love Jake and the Neverland Pirates! Shame their birthday was back in April or I'd have been wanting these invites for sure, maybe next year, but goodness knows what they will like then! My soon to be 4 yr old and I where looking at Jake and the neverland pirates birthday party stuff this morning (and I can across your etsy party package, which I will be getting) I feel like I could have written this post.LOL he originally asked for ANOTHER train party but I'm so over trains so I asked if he would want to do Pirates, since Jake and the neverland pirates is his favorite show also.